If you have to boil down to one single factor why “Genesis Of The Daleks” is so deeply influential on the later history of Doctor Who, it wouldn’t be the one implied in the title. Sure, this is the story that gave the Doctor’s most persistent enemies an origin. But what was more important was that with the introduction of Davros, their insane creator, the Daleks were finally given a face. This had always been a problem with the Daleks. Despite their ongoing popularity, distinctive design, and iconic status as the original Doctor Who monster, it was hard to make effective characters out of creatures that had been designed on purpose to have so little individuality. Although they weren’t robots, it was easy to forget that distinction since every Dalek looked alike—a mechanistic melange of an insect and an armored tank, with only the occasional color variation to mark those of different rank. And they all had the same hostile and aggressive personality, which they could only express by shouting and shooting at things. None even had individual names. The whole point of a Dalek is that it’s a fascist, conformist bully that wants to eliminate anything that isn’t a Dalek. It’s the Nazi ideology taken to its logical extreme. So it makes perfect sense that when Terry Nation, the writer who had invented the Daleks in 1963, was asked to show how they had been born, he leaned heavily on that concept again, placing the Dalek spawning grounds in a twisted militaristic society ruled through fear by its SS-like secret police and, in Davros, its own Hitler—a ranting, domineering despot with dark dreams of glory. This newly invented Dalek mythology didn’t quite square with what Nation had established 12 years earlier, when the Daleks were clearly shown to be motivated at least as much by self-loathing and terror of other people as by arrogant aggression, but it’s hard to argue the point too strongly. If it doesn’t make a crystal-clear logical connection to the events of “The Daleks,” “Genesis Of The Daleks” hits the emotional target dead-on. The war-torn world of Skaro really feels like a place the Daleks could have come from: Corrupt, ruined, poisonous and grim. But I should back up and focus on the Doctor’s part of the story for a moment, because in its own subtler way it’s just as earth-shaking as anything that Davros and the Daleks are up to. It opens with a twist on what had been a familiar scene throughout the Third Doctor’s five-year run: One of the mysterious and seemingly all-powerful Time Lords shows up to give the recalcitrant Doctor a mission, part of his ongoing, unwilling subservience to Gallifrey after being caught and convicted of time meddling in “The War Games.” In this case, he’s being sent to destroy the Daleks, or at least make them less dangerous, before they’re ever created. A couple of things make this different from the usual way this kind of scene had played out previously. First, he’s given a longer leash than usual: Instead of being dragooned without a choice, he’s actually given the option to refuse. This is perhaps a minor point, since a) he wasn’t likely to say no to fighting Daleks, and b) the Time Lords were so sure he’d agree that they simply sent him to Skaro anyway. But it’s also a sign of the Fourth Doctor’s increased independence over his previous regeneration that this would even be an issue. For all his kvetching, Jon Pertwee’s Doctor never did wind up quitting his job at UNIT, and it was Tom Baker’s version who finally stopped taking orders from the Brigadier. Although the Time Lords would go back to their imperious ways again soon enough, the fact that he takes on this mission by mutual agreement is a harbinger of the much more dominant relationship the Doctor would have with Gallifrey in future seasons. The other difference is much bigger: For the first time, the Time Lords ask the Doctor to deliberately change history. Perhaps surprisingly, that’s something the show had usually avoided. Sure, for 12 seasons now the Doctor has traveled through time without taking any particular care to preserve history, and presumably all that foiling of evil plans throughout the years must have had some effect on history, but there was always a basic underlying assumption that altering the past was either impossible (as in “The Aztecs”) or a villainous act (as in “The Time Meddler”). Here, changing the past is literally the Doctor’s mission—a bit of undercover work he’s assigned the way James Bond is told to go foil SMERSH. And like a secret agent’s assignment, it has the faint whiff of something that’s not-quite-proper despite any noble intentions behind it—after all, he’s being asked to be willing to commit genocide against the Daleks. Which is, in the end, an act of war, and is only justifiable if you accept the idea that the Daleks deserve to be wiped out because they wouldn’t hesitate to do the same to others, even if they haven’t actually exterminated anybody yet. This is the major problem with the way Nation treats the Daleks in this story—not only by comparing them to a pestilential virus but by explicitly stating that Davros has removed their consciences, we’re not given any choice but to view them as psychopathic murderers. So when the Doctor gives his climactic “Have I the right?” speech, paralyzed by hesitation just at the point where he could trigger a bomb that would wipe out Davros’ entire stock of embryonic Daleks, it’s harder to take his side than I think you’re supposed to. It’s too bad that “Genesis” treats the Daleks as if they have no moral agency of their own—as if they’re computers that can be programmed rather than the twisted, mutated wreckage of what had once been people and, importantly, are still people, horrible physical mutations and all. If they’re not people, then there’s no genocide in exterminating them. If they’re just a virus, there’s no harm in a vaccine. It’s also interesting that the Doctor turns out to be a catastrophically incompetent secret agent. And here I’m not talking about his reticence at genocide, but the fact that he had accomplished nothing before that point but to destroy Davros’ information on future Dalek defeats—which he himself had given to Davros after allowing himself to be captured and interrogated. Far from stopping the Daleks, his presence very nearly makes them invincible. I think this is another case where Nation’s dialogue doesn’t quite work for what the story needs it to do, because what’s happening in that sequence is that Davros beats the Doctor at his own game, turning the tables on those who seek his own destruction and potentially taking on the mystic power of the Time Lords when only a few days ago he didn’t believe in life on other planets. But instead of a shocking victory for the villain, it comes across largely as the Doctor screwing up. None of that should take away from the essential awesomeness of Davros as a character—a bizarre and grotesquely disturbing human/Dalek hybrid who outwits the Doctor only to meet his doom at the hands, or at least plungers, of his own children. 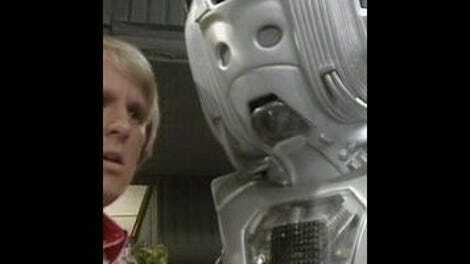 He was a new kind of character for Doctor Who, one that probably couldn’t have been done before season 12, when producer Philip Hinchcliffe and script editor Robert Holmes pushed the series hard in a darker, gothic-horror direction. And he was also a twistedly morbid parody of the Doctor himself—specifically the Third Doctor, who was, like Davros, an eccentric scientist working alongside a military organization. 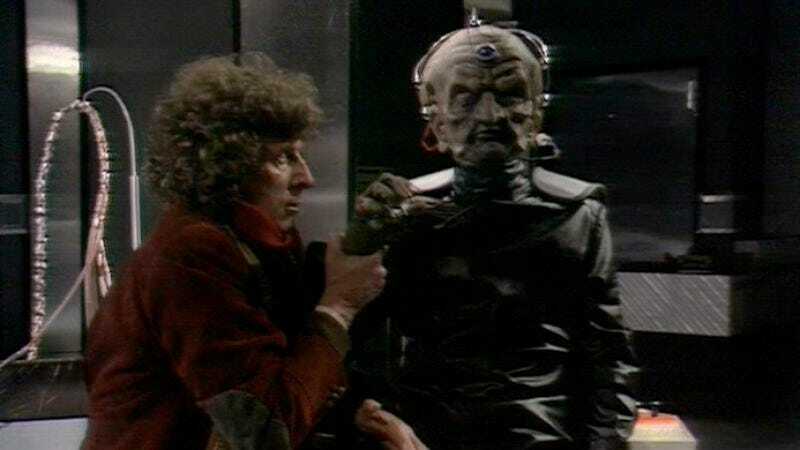 But if his children rejected him with extreme prejudice, Davros won in the end against them as well, because the ongoing narrative refused to let him be exterminated. Davros came back again and again, appearing in every Dalek story after this one until the 1989 cancellation, taking up a central role in the Dalek mythology despite that the Daleks themselves veered between treating him as a useful ally, a father figure, or just another lesser being who ought to be exterminated. It wasn’t until the new-series relaunch that the Daleks stood on their own as the series’ top villains—though Davros did show up again for the Tenth Doctor’s “The Stolen Earth/Journey’s End,” and probably will return again someday, it’s not like the old days when, for about 15 years, the story of the Daleks became essentially the story of Davros. I’ll pick up that thread again in the coming weeks as we hop forward through all four of the next Davros serials. • Just by nature, “Genesis Of The Daleks” was bound to be a fairly bleak story, if for no other reason than that the Doctor was never realistically going to be able to win: The series needs the Daleks to stay villains, and sure enough that’s how things play out. This sort of grimness wasn’t unknown on Doctor Who, particularly in Terry Nation scripts—“The Dalek Invasion Of Earth” often played as a “what if the Nazis had won World War Two” allegory, showing a corrosive effect on basic human decency. But But “Genesis” hits the dystopian angle surprisingly hard: The Kaled/Thal war simultaneously has all the worst qualities of World Wars One, Two, and Three, with plenty of Orwell’s 1984 for good measure. And the Thals don’t get to be the good guys here, unlike previous appearances on the series—they’re just as brutal as the Kaleds, using slave labor to build radioactive missiles for the war effort. We meet only a handful of individuals who prove themselves to be more than mere thugs, and most of them are slaughtered before the end of episode six.